Too Much Tuscan Sun….is there such a thing? Today I read “Too Much Tuscan Sun – Confessions of a Chianti Tour Guide.” Through this book I fell in love with the Chianti countryside, from the violence of the rainstorms to the bumpy roads leading to abandoned farmhouses to the three hour lunches. I could taste, smell and feel it all. The book is written by Dario Castagno who owns Rooster Chianti Tours and it is ostensibly about his many experiences with ugly (as well as nice) American tourists. There are many funny remembrances as well as lively descriptions of Americans tourists that filled me with utter embarrassment. But as Dario says, one can’t judge a country by a few of it’s inhabitants – something we should all remember. What struck me most wasn’t the tours gone bad. It was how absolutely in love Dario is with the region and how delighted he is to share this with us. I picked up this book to read the tour vignettes but left it feeling like I had actually traveled to Italy. 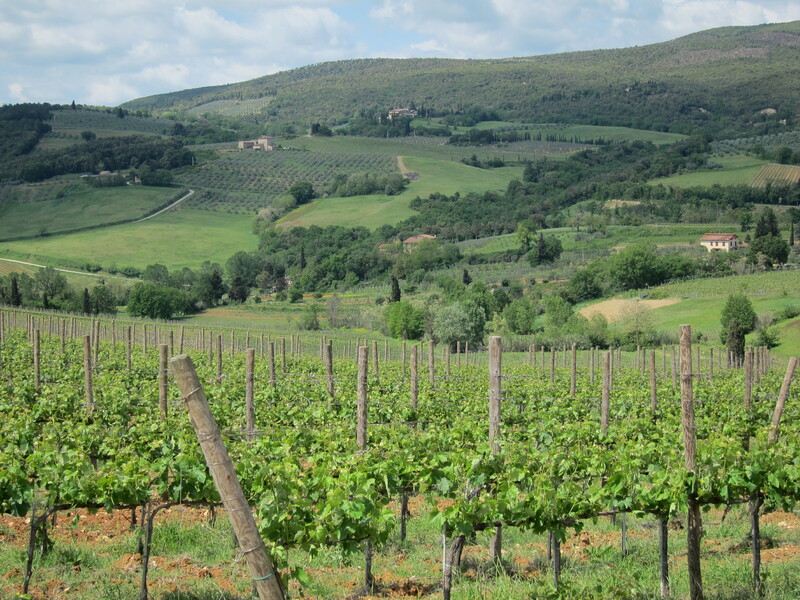 As part of my upcoming trip in May, I will be visiting the Chianti area and many of the towns he talks about. I can’t wait. Ciao…always a pleasure reading these pleasant reviews. Too Much Tuscan Sun was written many years ago and was the first book of a series. Then came A Day in Tuscany-Too Much Tuscan Wine- An Osteria in Chianti and District 9. The book is not picking on Americans but simply my experiences as a tour guide; as it happened 99% of my clientele came from the US. If I had worked with my own fellow countrymen I believe the book would have been much thicker! However Chianti Rooster Tours is no more…I simply conduct wine tours at Dievole winery http://youtu.be/oySuWic9QZ4 and I hope to meet you there! Grazie Dario! I just received “A Day in Tuscany” and will start reading it tonight. So far I think I loved Too Much Tuscan Wine the most! Great story line. I would talk about it, but then it would ruin it for everyone 🙂 Wish I had saved it for the plane trip to Italy next week.